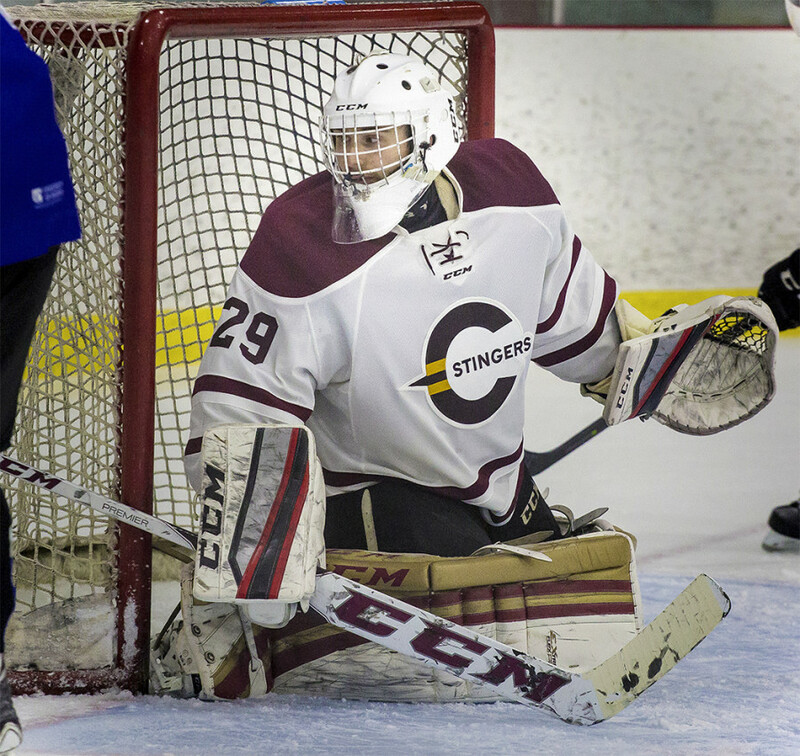 Antoine Marchand, the president of SWARM and goaltender for the Concordia Stingers, sat smiling and laughing at his desk—reflecting on his time with the team. The office is decorated in Stingers memorabilia. A white board hangs on the wall next to his desk marked with upcoming Stingers events—hockey pucks are lined at the bottom of one of the office windows overlooking Concordia’s Hive Café. It’s a modest office for a student-run Stingers supporters group and someone who played such a large role for the Stingers family. After spending four seasons as the third-string goalie for the men’s hockey team, Marchand proved that leadership doesn’t necessarily have to come from the ice. He accepted his role on the team and carved out a niche for himself. “It sounds really cheesy but I try to say that it’s important to have a positive impact on the people around you, whether it’s the guys, the stingers or SWARM,” said Marchand. Roughly two weeks ago the Stingers men’s hockey team ended their season in dramatic fashion to the Queen’s University Gaels. The loss was hard on the Stingers, who displayed confidence throughout the entire season, and it meant the end of the line for some key parts of the leadership core. Of course, the Stingers will be without long-time captain, Olivier Hinse, next season. But while Hinse was the face of the team, Marchand took on the role as a leader behind the scenes. “He was a leader, even if he was not playing he was a big part of our team,” said Stingers head coach Marc-Andre Element. In his first full season as head coach of the hockey team, Element renewed a sense of pride within the locker room. His motto to “leave a footprint,” struck Marchand hard and changed his perspective about his role on the team. “He established that being a Stinger wasn’t necessarily just being a hockey player,” said Marchand. It’s a long way from when he first joined the team four years ago as a freshman. A quiet and shy kid from Montreal, Marchand didn’t know what to expect when he joined the team. It seemed as though most of the decisions he was making were based on the belief of others and not his own. “There was a lot of expectations I felt for myself and I wasn’t sure what I wanted relative to what I felt other people wanted from me,” said Marchand. Once he realized that the game was so much more than just being on the ice, the inner growth really began to take shape. During his first season with the Stingers, Marchand—who was still slightly reserved and kept to himself—decided to model himself after Olivier Hinse. The latter was in his second year with the team but it seemed inevitable that he would take the mantle of captain. By his third season, the two players would become inseparable, spending much of the previous summer training together. He credits his friendship with Hinse as one of the key factors to who he is today, a humble leader who doesn’t need to be in the spotlight. “He really stepped into his leadership role when I got there and seeing [Hinse] grow as a leader, helped me grow as a human being,” said Marchand. This past season, his fourth as a Stinger, he continued to have a positive influence on the team, which changed drastically with 14 new players added to the roster. Element made a conscious effort to surround the team with leaders he believed could bring a positive influence on the rookies. “I think he was just such a positive guy because of his positivity in the room and around the room. He was a nice guy to have around and you knew you could go to him with any problems,” said first-year forward Anthony De Luca. That’s how Marchand carried himself as a Stinger on the ice and off the ice. De Luca was just one of the players that he reached out to in order to make a smooth transition onto the team. Marchand’s selflessness was eventually rewarded with an unforgettable experience: playing in front of the home crowd at Ed Meagher Arena. “I wanted so badly to put him in for a couple minutes so he plays in front of the crowd, in front of his friends and that’s because he’s a true leader and a real professional,” said Element. Although he only played nine minutes, he was able to close out the final regular season game—his last as a Stinger—in front of the home crowd. And as much as it was a pleasurable experience for Marchand, it was also a rewarding feeling for his teammates. “I think we all wanted him to play and it meant a lot to him, it was his last [U Sports] game. We were just really happy to be able to share that moment with him,” said De Luca. Moving forward, now that he will graduate with a major in international business, Marchand hopes to bring his leadership skills elsewhere, whether it’s in Europe with a hockey team or completing another degree in law. Marchand will surely miss being with the Stingers day-in and day-out and his absence will be felt throughout the team. “It’s a big loss for the program but there’s some guys that are going to have to step up,” said Element.